Kevin wrote in this week asking me if I could show some meals that utilized a slow cooker, as he’d love to cook more inexpensive and healthy dishes at home but he’s often strapped for time in the evenings. 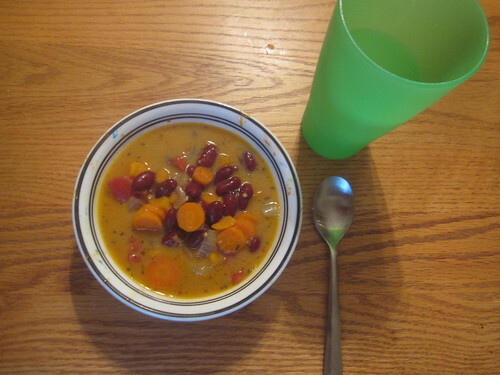 One of our favorite slow cooker recipes is Jamaican red bean stew, a delicious thick stew that turns out wonderfully after cooking slowly all day in a slow cooker. You can prepare it in about fifteen minutes in the morning before you leave and your house is fragrant when you get home. All you have to do is chop some vegetables and toss some stuff in the slow cooker in the morning! This will make a healthy pot of soup – our family of four ate this soup for dinner, then for lunch, and there’s still about 1/3 of the soup in the freezer. If you’re single or just a couple, you may want to halve the recipe. This recipe is based on Robin Robertson’s Jamaican stew recipe from Quick-Fix Vegetarian cookbook, though we’ve modified it quite a bit. The ingredient list is pretty straightforward. Most of the ingredients are either fresh vegetables or spices you should already have on hand. The receipt totaled $9.80 for the ingredients and produced 12 servings of the stew, which means the cost per bowl was around $0.80. 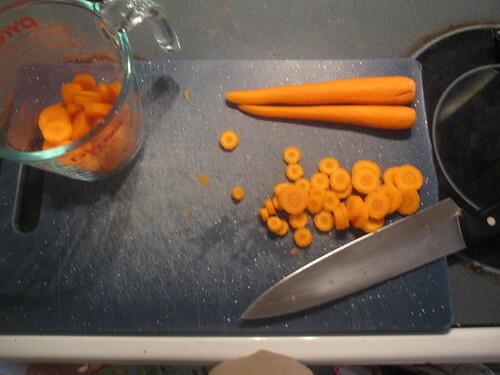 If you wish, you can slice the carrots, chop the oinion, and dice the sweet potatoes the night before. This will cause a slight alteration of the procedure in the morning, but don’t sweat it. If it’s more convenient for you to do things this way, prep the vegetables and keep them in the refrigerator overnight. If you’re doing the vegetables in the morning, put the olive oil and the garlic into the slow cooker and turn it on high while you’re preparing the vegetables. If the vegetables are prepared, just add the olive oil and garlic first and turn the slow cooker to low. When the vegetables are ready, start adding ingredients, going straight down the list above. Stir the stew as you’re adding ingredients to make sure the liquid is getting everywhere and distributing the spices all around. The coconut milk may have some “curds” in there, but don’t worry about it – they’ll go away throughout the day. Set the slow cooker to low, put the lid on, and leave it all day. When you come home that evening, serve! If you’d like, slice up some cooked cured sausage and add to the stew, as you desire. Another ingredient that would work reasonably well would be diced ham. In any regard, this is such a hearty stew that it’ll function just fine as a standalone meal.